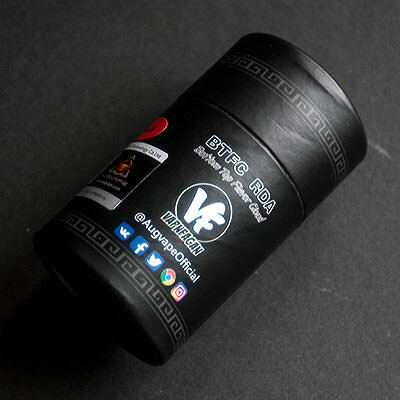 I received this BTFC RDA free of charge directly from Augvape for the purpose of this review. Regardless of this, it will not color my opinion on this review in any way, shape or form. This one as the other attys that come from Augvape is delivered in the Cardboard Tube we have seen so many times before. When you open it up you find the RDA sitting on top and underneath it you will find the goodie bag with its content. 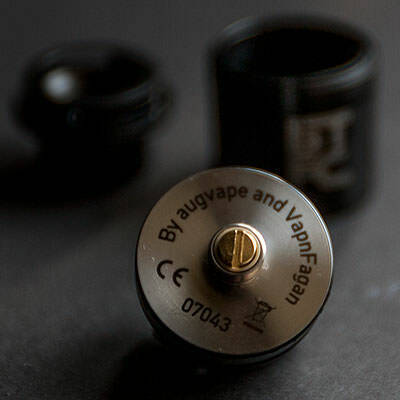 This is a collaboration between Augvape and VapnFagan and it is a 25 mm 3-piece RDA with both bottom and top airflow. 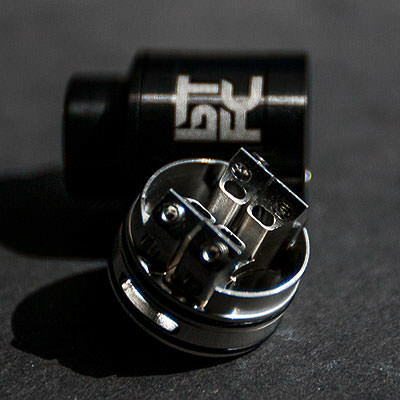 The letters BTFC apparently stands for Bottom Airflow, Top Airflow, Flavor and Clouds. The deck is a raised two post system where the coil legs is put in at a downward sloped angle towards the outside of the deck. It is easy to build on and as easy to wick since you got enough room for the cotton. The space between the posts is a bit crowded, meaning that it will leave you with the coils pretty much together, depending on what ID they are of course, and when you drip you will drip on the coils and it will get down into the airflow holes and of course start leaking. When you squonk on the other hand the liquid comes from beneath and never hits the coils and therefore doesn’t go down the airflow as easy. As I said in the beginning it has both bottom and top airflow. 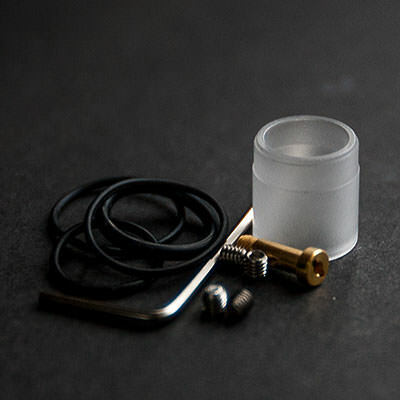 The bottom airflow goes through the posts and come up underneath the coils to improve on flavor and as stated on Augvape’s site the top airflow is for clouds when used with the bottom airflow. It is actually really smooth and neither of the bottom or top airflow has given me any whistling or any other bad sounds. The top cap is domed a bit, also in order to improve flavor and the barrel has the letters BTFC etched into one side of it and that’s it. As most new RDA’s today this one as well utilizes 810 drip tips and I have tried a few of mine and they all sit loosely on it. 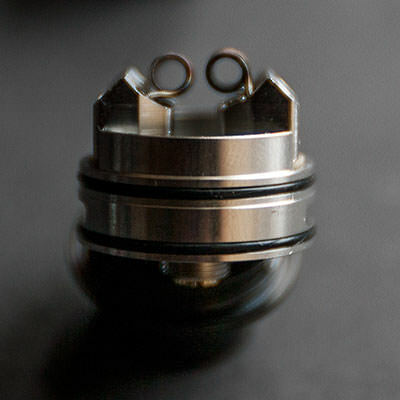 This means that the opening for the drip tip is a bit on the wide side and not really 810. My absolute pet peeve on RDA’s is bad O-rings, no matter if they are too loose or hold too tight. Fortunately on this one they do work as intended and keep things together nicely. So how does it perform… Overall it works really nice in squonk mode, at least for me. The way the deck is with the bottom airflow and limited space doesn’t make this a good dripper RDA. It does deliver on flavor and gives you good flavor. It’s not fantastic or amazing but it is up there with a lot of other RDA’s I have tried so far this year. The experience with the BTFC hasn’t been a bad one at all, besides the leaking issues that I had when I was dripping with it. As a squonk atty on the other hand it has worked much better. The 810 issue is also a thing that makes the experience less of a nice one since the attached black and frosted drip tips are not up my alley at all. 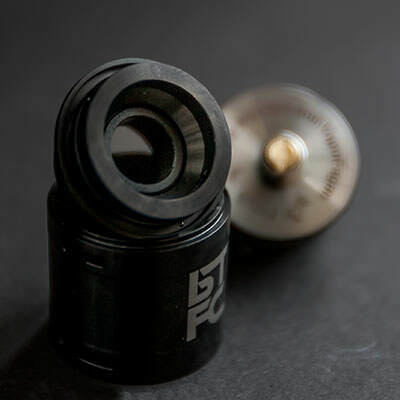 If you are in the need of an 25 mm RDA that is best suited as a squonk RDA I would say why not… It is well built and it is priced fairly as well. Another great review man! Thanks for sharing! One thing i hate is leaking, for me it just isn’t enough that it works on a squonker, i want to be able to use it on any device. The hermetic might just be a winner as i’m looking for a single coil (non leaking) rda. @adary Thanks man and if you get one it would be nice to know what you think of it. @UW1 I must agree on the leaking, it totally blows to be honest. Thanks bro. Thanks man and if you get one it would be nice to know what you think of it. Nicely done (again) @Norseman. Good heads up on the leaking factor as that is always paramount for me. A very fair review. Excellent and thanks! Great review Bro, here is another modern device, interesting deck, and based on your review looks like it would work well.